The Companion is the intermediate among shovels offered by Backcountry Access (commonly known as BCA), somewhat larger than its Tour model (which I have separately reviewed).� Like most backcountry snow shovels the handle and blade are separate pieces for more efficient pack storage.� BCA calls the Companion "Our original integrated shovel & probe system," and it was a system when I purchased mine � included was an avalanche probe that fit neatly inside the handle, in the same manner as the Tour.� Now the probe is optional, and so my review is limited to the shovel. MSRP: Not specified. 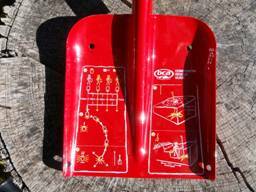 BCA's website does not include means for purchasing any shovel directly from the manufacturer, though it does give links to online retailers in the United States and Canada, and a search tool for finding dealers in other countries. Color: The blade is red with yellow graphics. Options: I have a fixed-length handle; the Companion is also available with an extendable handle.� As noted, BCA sells an avalanche probe that will stow inside the handle. *The metric dimensions in the "Listed" column come from the website, in the "Measured" column from my conversions. I carry a shovel on every winter backpacking trip or day hike when I may encounter snow, and often when skiing inbounds at a resort.� That meant about fifteen days last winter, in Utah, Idaho, Wyoming, Montana, and British Columbia, from blizzard to bright blue skies and from -5 to 70 F (-22 to 21 C), and from feathery Rocky Mountain powder to spring slush to heavy breakable crust.� A shovel is first of all a safety piece but also a useful camp tool in the snow.� I used the Companion to search for the transceiver in avalanche drills; to dig an avalanche pit or a depression just outside the door of my tent for putting on and taking off my boots; to flatten snow for a tent site; and (blade only) as a stand for my stove or seat for me. I store the two pieces of the Companion separately in my pack, even though I can (just barely) fit the assembled shovel into the main compartment of my 7400 cubic inch/120 liter expedition pack.� When wearing that pack, the blade is the last thing added to the main pack bag, so it's at the top and easily accessible; the handle I lash into a side pocket with a compression strap run through the D-handle.� My day packs all have a kangaroo pocket on the front, which is where I stow the blade.� The handle goes into a side pocket or, on one pack, into a fabric tube (custom- ordered just for this purpose) inside the kango.� When it comes time to dig I can easily assemble the two pieces by depressing the two buttons on the handle and� then sliding the handle into the throat of the blade until the buttons snap into corresponding holes on the throat. As can be seen in the photograph the blade has four holes so that it can be used in an emergency as a deadman anchor.� The Education Graphics are printed on the face of the blade.� This is a great idea, making use of space normally consisting just of advertising, a decorative graphic, or color coating.� The graphics illustrate numbered steps for search protocols for individual and group searches, pinpoint search, probing, and digging for a body.� They are something of a security blanket for an occasional backcountry skier like me, as I don't have to worry about forgetting proper technique in the panic of an emergency.� After one winter the pictures are as readable as when I bought the Companion, unaffected by snow or rubbing against items in my pack. 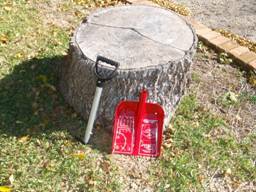 As a digging implement the Companion works as it should.� The two pieces, when assembled, do not slide about or come apart.� I can lean on the top of the blade without fear of bending the hard-anodized aluminum.� The anodized aluminum blade has driven through hard-packed snow, surface ice, and icy crust ice quite well.� I've had an occasional problem with thick ice, including that which can build around a snow anchor in a spot that's exposed to sunlight during the day and then freezes solid at night, but I've always managed.� The shovel blade shows a few scratches and scrapes from use but remains unbent and undented, even at the bottom edge. I bought the Companion after losing the blade of my Tour system and stepped up for the larger size in order to get more bite for each stroke.� That, it turns out, was a wise choice.� I haven't been keeping score but I believe that I've taken less time to dig the usual vestibule and avalanche pits.� The D-grip has helped, too; I often wear mittens or lobster gloves (three extensions above the palm, for thumb, index finger, and three outside fingers) and I get a much firmer grip than when I have to curl fingers around a T-grip.� I haven't noticed any difference in the efficiency of my snow pits from the "super flat back." Overall the Companion has been a fine all-purpose backcountry shovel, something I'm glad I have even when it never comes out of my pack. Probe-compatible.� Using the Companion's handle for my probe means no extra space taken up in my pack, and I always know where my probe is stored.